Center for Sight & Hearing-Is Summer Too Loud? ‘Tis the season of outdoor fun! From Memorial Day until Labor Day, we spend our days participating in activities we look forward to all winter long, but, did you know many of those ventures are damaging to the ears? Below we discuss common ways to protect your hearing, while still enjoying the summer fun. We’ve all covered our ears during a firework show due to extreme noise. The World Health Organization lists 120 decibels as the pain threshold for sound, including sharp sounds such as thunderclaps. 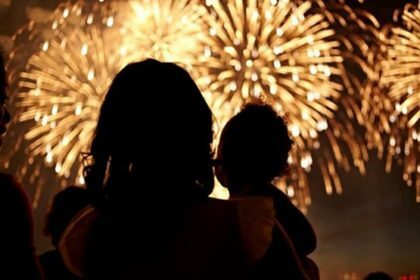 The finale of a firework show can sometimes be loud enough to rupture your eardrum! Yard work is seemingly harmless, but lawn care equipment can damage your hearing too. Fun fact! Electrical equipment is quieter than gas-powered. While making preparations to get your yard summer ready, consider protecting yourself by wearing earplugs when operating lawn equipment such as hedge trimmers, lawn mowers, or leaf blowers. Everyone looks forward to dusting off their summer toys once the weather finally permits. Motorcycles, jet skis, four-wheelers, and convertibles can reach decibels as high as 120. What do these all have in common? High speeds! The high wind speeds produce a loud noise, which can cause hearing loss. What’s summer without good music? If you’ve attended a concert, you’ve likely experienced a ringing sensation in your ears the following day. Concerts always raise the risk of hearing loss, especially if you’re close to the stage or outdoors. Indoor concerts can be more hazardous as all the sound is “trapped” inside the room. Outdoors, there are not as many reflections, so generally the further away or more “off-axis,” the safer you are. So, how do you know when you’re exposed to dangerous noise? There are plenty of free apps, such as Decibel X, that will give you an idea of how loud things are. Though they aren’t always completely accurate, they will give you a better idea of whether you’re at risk or not. Selecting the best hearing protective wear is crucial to ensuring that your hearing is correctly conserved. Protective earwear can come in many different shapes and sizes depending on your situation. Our specialized experts can fit you with the correct protective earwear designed specifically for your favorite pastime. To make sure that you are wearing equipment that meets your needs, visit our hearing conservation specialist at the Center for Sight & Hearing!